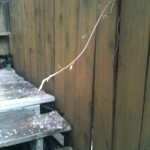 When we moved into this house thirteen years ago, the trellised back deck was devoid of plant life. 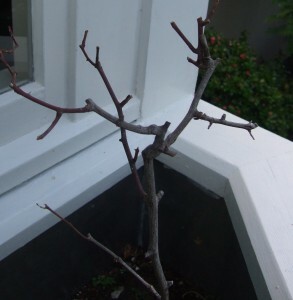 Even the hardy Iceburg roses in the built-in galvanized steel planter boxes were leafless due to a malfunctioning irrigation system. The main garden was a flight below. It appeared that if I wanted to find green space I would need to walk down into the garden past the leafless rose twigs branches. A visiting gardener friend despaired. “Maybe we can create some vast mounds in the back to lift the garden closer to the main living space,” she suggested. I didn’t really want a backyard mountain, so I resigned myself to a destination garden and set out to fix the irrigation in the deck planter boxes. Miraculously, those dead roses responded to water and came to life again. I added some pretty pots to the deck and filled them with lavender and salvia and other sun-loving perennials. 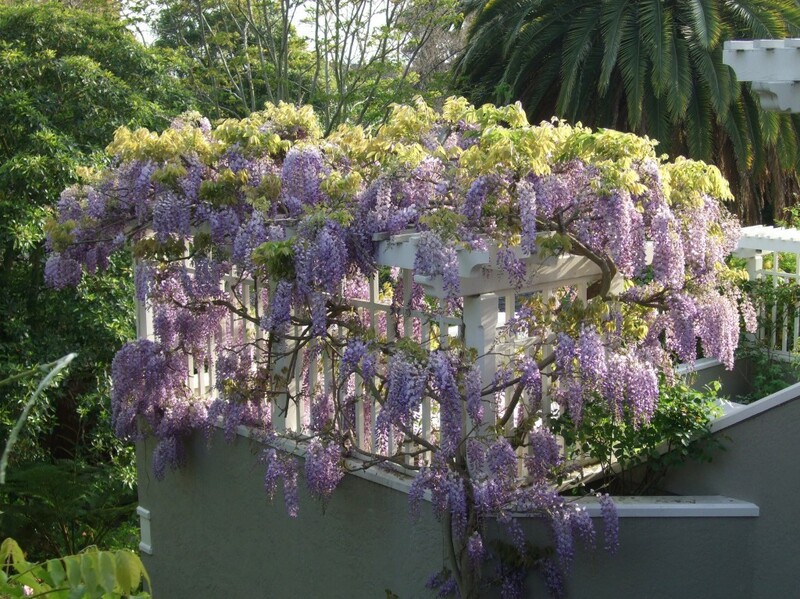 A few years later, the man who came to tend the garden once a month proposed running a wire between the lower level fence and the deck trellis to train an unruly wisteria strand. Nice idea, but I figured the vine wouldn’t be able to climb so high during my lifetime. Shame on me. 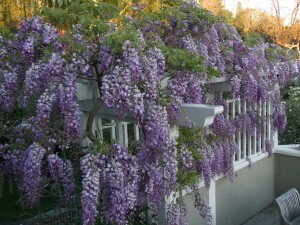 Within a few years that entire left trellis was covered with the most glorious display of wisteria. My success with the wisteria gave me confidence to tackle the facing trellis, still bare and calling out for some garden love. 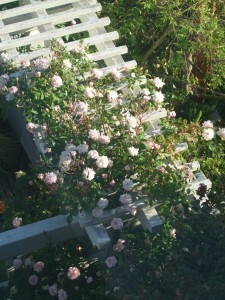 I decided to plant a hardy climbing rose and ordered two bare root Cecil Bruners. They took a few years to make their way out of the shade below. But last year they covered the trellis with fragrant pink blossoms that bloomed just as the wisteria blossoms started to fade. And what did this whole process teach me? That when you garden, it’s often in the gap you find the glory. Where once there was nothing, now there is the most glorious display in my garden. Filling the void brought the biggest reward. 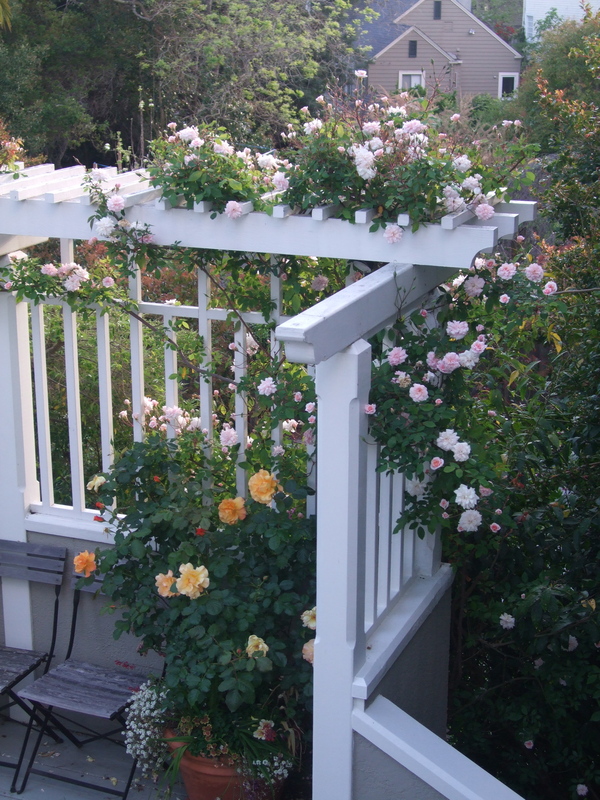 Note to readers: pruning a skygarden like my second story deck garden can be a little tricky. Here are some tips for pruning wisteria but please Be Careful! This entry was posted in Shelter and tagged gardens. Bookmark the permalink. Post a comment or leave a trackback: Trackback URL. Those plants are absolutely stunning. 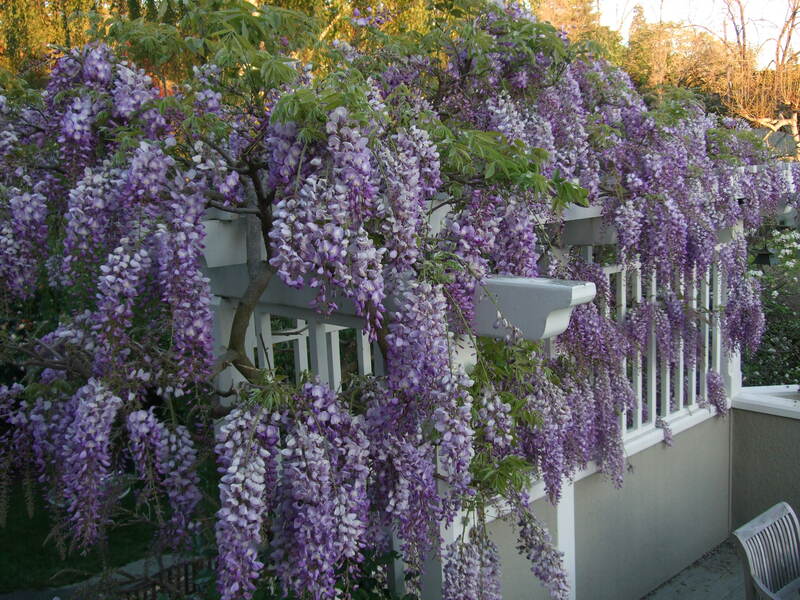 Eight years ago I planted wisteria along a chain link fence in my backyard. I am amazed at how it has taken off. It took a while to get going, but this year It is loaded with buds that will probably peak next week. I love those purple blossoms. So nice to hear from you. 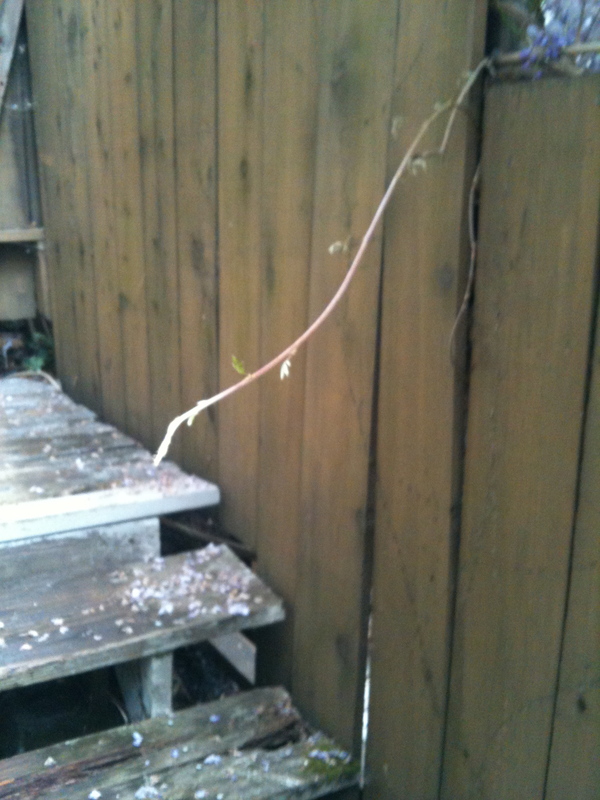 I love thinking of your wisteria blooming just as mine starts to wane.